Andrei, a young man who has cerebral palsy, grew up in Southwest Michigan and didn’t give much thought to government and politics – it always seemed like an abstract concept. He certainly never thought it would be part of his career path. When Andrei was 14 he traveled to Washington, DC with his parents on vacation and that peaked his interest a bit. Andrei attended college where he studied history and communications and his interest in politics grew. In 2015 Andrei learned about Disability Network Southwest Michigan’s summer internship – Advocacy Academy. He applied and was accepted, spending two months emerged in learning the skills of advocacy including how to develop and implement an advocacy campaign. Andrei says that his experiences in Advocacy Academy solidified for him the path he wanted to be on and gave him the confidence to know he could make it happen. There was no stopping him! He made some local connections who put him in contact with people in Washington. Andrei made several trips by train to Washington, meeting with as many people as he could each trip. On his third trip he interviewed for a position with the US House of Representatives and was hired on the spot! From there he moved to a position in the House Majority Whip’s office. 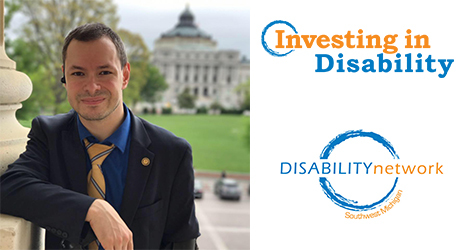 Andrei continues to live in Washington and says he feels like he’s “living the dream!” Disability Network is happy to have played a role in helping Andrei build the skills and confidence he needed to make this leap in launching his career. Congratulations, Andrei! Disability Network Southwest Michigan needs your support to help us continue to make dreams come true for young men like Andrei. When we invest in disability, the entire community benefits. Join Disability Network Southwest Michigan in creating a diverse and inclusive community by investing in people with disabilities. We cannot do this important work without your support. Please consider a donation to Disability Network today.